It’s time to ditch the cereal and stale muffins and start cooking better breakfasts in your RV. 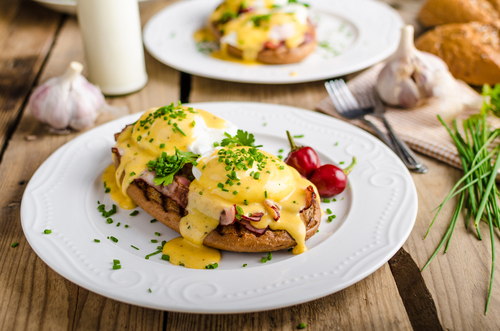 This simple eggs benedict recipe is the only one you’ll need to prepare delicious “eggs benny” for yourself and your fellow campers with limited ingredients and time. Poach the four eggs. Use an online tutorial to help you poach the eggs perfectly if you’re inexperienced at poaching. Don’t worry, it’s easy! Poke a fork into the sides of the English muffins. Work your way through until the muffin is split in half. Toast each side of the muffin until lightly browned. Fry the pieces of ham until they’re browned. The ham should not be chewy or tough. When you start poaching the eggs, start cooking your Hollandaise sauce as well. Set up a double boiler by placing a heatproof bowl on the rim of a pot. Add 1/2-inch of water to the pot before covering it with the bowl. Don’t let the bottom of the bowl touch the water. Pour the yolk and butter into the bowl and turn the stove to medium heat. Whisk the Hollandaise until there are no remaining lumps. Stir in the lemon zest and salt, then add in the boiling water. Whisk constantly. Continue whisking until the Hollandaise is thick and creamy. The temperature should be about 160 degrees. Do not overcook the Hollandaise. Remove the bowl from the pot using an oven mitt, then whisk in the lemon juice. Taste the sauce and add salt if needed. Place toasted English muffins on a plate and top with a slice of ham. Place the poached egg on top and smother with Hollandaise sauce. Garnish with paprika and enjoy. Find the RV of your dreams, complete with a full residential kitchen, right here at Fretz RV in Souderton, Pa.